I often hear people complaining about the lack of inspiration sources on how to dress fun. In my opinion, you don't have to have a subscription to all the fashion magazines in order to find fashion inspiration. Think about things that surround you or the things you love such as movies, music videos, famous people, art, mother nature...etc, etc, that can be a source of inspiration. I can't count how many times I've found fashion inspiration in flowers. Yes, when I see a certain flower with a beautiful mix of colors or even shapes, I immediately think about how to apply that combination in an outfit. The same happens when I watch movies (mainly old classic movies). I take mental notes of what someone is wearing in the film. Sometimes, I even take photos of that particular person in order to keep it in my inspiration album on my phone. The look you are seeing today was inspired by a 1960's French movie called "Belle De Jour". Despite the storyline of the film, which isn't quite Valentine's material (A housewife spending her afternoon as a prostitute), Catherine Deneuve as Severine Serizy wore proper, classy clothes (YSL's designs) that helped her present a proper appearance during her double life. I love so much the shoes she wore in the movie (Roger Vivier) which, as you can see, I now own a similar pair. 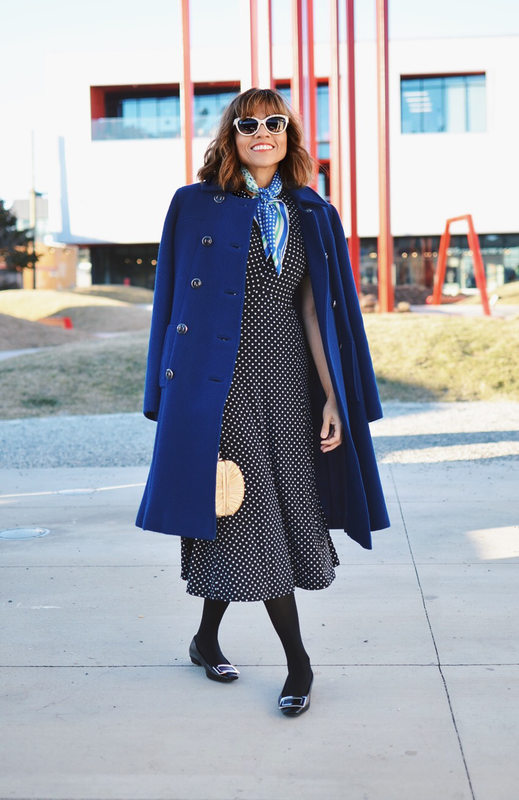 I already had a double-breasted (military-inspired) vintage coat, so it was easy for me to put the look together. Of course, I didn't want to copy her style to the T. I had to add my own touches in order to make the look more personal and also suitable for the occasion and weather. Like for example, instead of wearing a dress above the knees as she did in some parts of the film, I decided to wear a romantic midi dress. 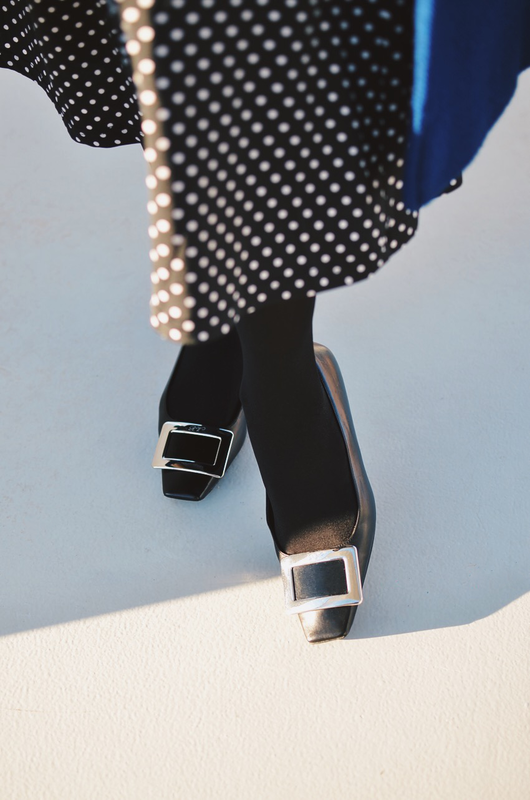 I would have preferred to wear my dotted dress and pilgrim shoes without tights, but the day was a tad too chilly for completely bare legs. As you can see, in this look, I'm not wearing red or heart prints in order to make it appropriate for Valentine's day. There are other romantic pairings that you can do for that date depending on your style. I opted for polka dots because I find them as feminine as floral or heart prints. 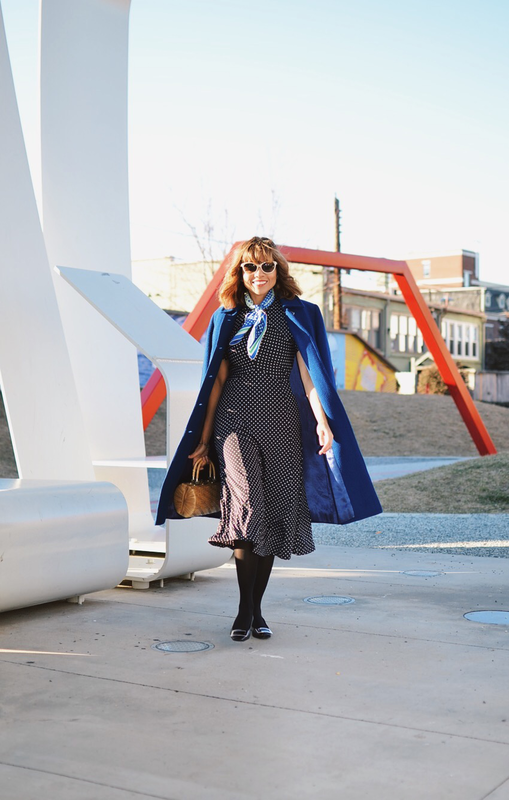 I accessorized my dress with a colorful polka dot scarf that, besides adding an extra playful touch, it bonded the look of the coat and dress. Shoes: Roger Vivier/Dress: Vintage/Coat: Vintage/Scarf: Vintage/Bag: Vintage/Sunglasses: Valentino/Pearl Earrings: The Pearl Source.